Tanzania /ˌtænzəˈniːə/, officially the United Republic of Tanzania (Swahili: Jamhuri ya Muungano wa Tanzania), is a country in East Africawithin the African Great Lakes region. It is bordered by Kenya and Uganda to the north; Rwanda, Burundi, and the Democratic Republic of the Congo to the west; Zambia, Malawi, and Mozambique to the south; and the Indian Ocean to the east. Kilimanjaro, Africa’s highest mountain, is in northeastern Tanzania. Tanzania’s population of 47.4 million (2014) is highly diverse, composed of numerous ethnic, linguistic, and religious groups. Tanzania is a presidential constitutional republic, and since 1996, its official capital has been Dodoma, where the President’s Office, the National Assembly, and some government ministries are located. Dar es Salaam, the former capital, retains most government offices and is the country’s largest city, principal port, and leading commercial center. The name “Tanzania” was created as a portmanteau of the names of the two states that unified to create the country: Tanganyika andZanzibar. The name “Tanganyika” is derived from the Swahili words tanga (“sail”) and nyika (“uninhabited plain”, “wilderness”), creating the phrase “sail in the wilderness”. It is sometimes understood as a reference to Lake Tanganyika. The name of Zanzibar, on the other hand comes from “zangi”, the Persian name for a local people (said to mean “black”), and the Persian word “bar”, which means coast or shore. The indigenous populations of eastern Africa are thought to be the click speaking Hadza and Sandawehunter-gatherers of Tanzania. These movements took place at approximately the same time as the settlement of the iron-makingMashariki Bantu in the Lake Victoria and Lake Tanganyika areas. They brought with them the west African planting tradition and the primary staple of yams. They subsequently migrated out of these regions across the rest of Tanzania between 2,300 and 1,700 years ago. The people of Tanzania have been associated with the production of iron and steel. The Pare people were the main producers of highly demanded iron for peoples who occupied the mountain regions of northeastern Tanzania. The Haya people on the western shores of Lake Victoria invented a type of high-heat blast furnace, which allowed them to forge carbon steelat temperatures exceeding 1,820 °C (3,310 °F) more than 1,500 years ago. During World War II, about 100,000 people from Tanganyika joined the Allied forces and were among the 375,000 Africans who fought with those forces. Tanganyikans fought in units of the King’s African Rifles during the East African Campaign in Somalia and Abyssinia against the Italians, inMadagascar against the Vichy French during the Madagascar Campaign, and in Burma against the Japanese during the Burma Campaign.Tanganyika was an important source of food during this war, and its export income increased greatly compared to the pre-war years of the Great Depression Wartime demand, however, caused increased commodity prices and massive inflation within the colony. In 1954, Julius Nyerere transformed an organisation into the politically oriented Tanganyika African National Union (TANU). TANU’s main objective was to achieve national sovereignty for Tanganyika. A campaign to register new members was launched, and within a year TANU had become the leading political organisation in the country. Nyerere became Minister of British-administered Tanganyika in 1960 and continued as prime minister when Tanganyika became independent in 1961. British rule came to an end on 9 December 1961, but for the first year of independence, Tanganyika had a governor general who represented the British monarch. On 9 December 1962, Tanganyika became a democratic republic under an executive president. After the Zanzibar Revolution overthrew the Arab dynasty in neighbouring Zanzibar, which had become independent in 1963, the archipelago merged with mainland Tanganyika on 26 April 1964. 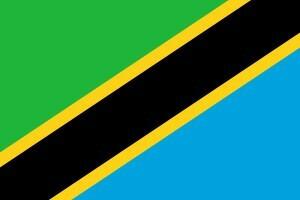 On 29 October of the same year, the country was renamed the United Republic of Tanzania (“Tan” comes from Tanganyika and “Zan” from Zanzibar). The union of the two, hitherto separate, regions was controversial among many Zanzibaris (even those sympathetic to the revolution) but was accepted by both the Nyerere government and the Revolutionary Government of Zanzibar owing to shared political values and goals. In 1967, Nyerere’s first presidency took a turn to the left after the Arusha Declaration, which codified a commitment to socialism in Pan-African fashion. After the declaration, banks and many large industries were nationalised. From the late 1970s, Tanzania’s economy took a turn for the worse. Tanzania was also aligned with China, which from 1970 to 1975 financed and helped build the 1,860-kilometre-long (1,160 mi) TAZARA Railway from Dar es Salaam to Zambia. From the mid-1980s, the regime financed itself by borrowing from the International Monetary Fund and underwent some reforms. Since then, Tanzania’s gross domestic product per capita has grown and poverty has been reduced. In 1992, the Constitution of Tanzania was amended to allow multiple political parties. In Tanzania’s first multi-party elections, held in 1995, the ruling Chama Cha Mapinduzi won 186 of the 232 elected seats in the National Assembly, and Benjamin Mkapa was elected as president. At 947,303 square kilometres (365,756 sq mi), Tanzania is the 13th largest country in Africa and the 31st largest in the world, ranked between the larger Egypt and smaller Nigeria. It borders Kenya and Uganda to the north; Rwanda, Burundi, and the Democratic Republic of the Congo to the west; andZambia, Malawi, and Mozambique to the south. Tanzania is located on the eastern coast of Africa and has an Indian Ocean coastline approximately 800 kilometres (500 mi) long. It also incorporates several offshore islands, including Unguja (Zanzibar), Pemba, and Mafia. The country is the site of Africa’s highest and lowest points: Mount Kilimanjaro, at 5,895 metres (19,341 ft) above sea level, and the floor of Lake Tanganyika, at 352 metres (1,155 ft) below sea level, respectively. Tanzania is mountainous and densely forested in the northeast, where Mount Kilimanjaro is located. Three of Africa’s Great Lakes are partly within Tanzania. To the north and west lie Lake Victoria, Africa’s largest lake, and Lake Tanganyika, the continent’s deepest lake, known for its unique species of fish. To the southwest lies Lake Nyasa. 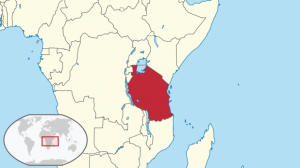 Central Tanzania is a large plateau, with plains and arable land. The eastern shore is hot and humid, with theZanzibar Archipelago just offshore. Approximately 38% of Tanzania’s land area is set aside in protected areas for conservation. Tanzania has 16 national parks, plus a variety of game and forest reserves, including the Ngorongoro Conservation Area. In western Tanzania, Gombe Stream National Park is the site of Jane Goodall’s ongoing study of chimpanzee behaviour, which started in 1960. Tanzania is highly biodiverse and contains a wide variety of animal habitats. On Tanzania’s Serengeti plain, white-bearded wildebeest(Connochaetes taurinus mearnsi) and other bovids participate in a large-scale annual migration. Tanzania is also home to about 130 amphibian and over 275 reptile species, many of them strictly endemic and included in the International Union for Conservation of Nature’s Red Lists of different countries. Tanzania has developed a Biodiversity Action Plan to address species conservation.